I hope you all had wonderful weekends! 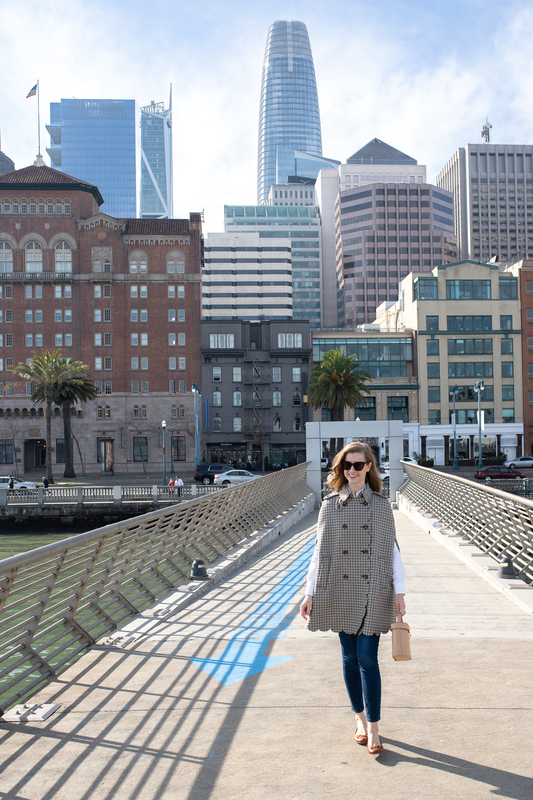 It was sunny in San Francisco these past few days (rarer than you might think!) and David and I got in several walks and hikes around town to enjoy the perfect weather. 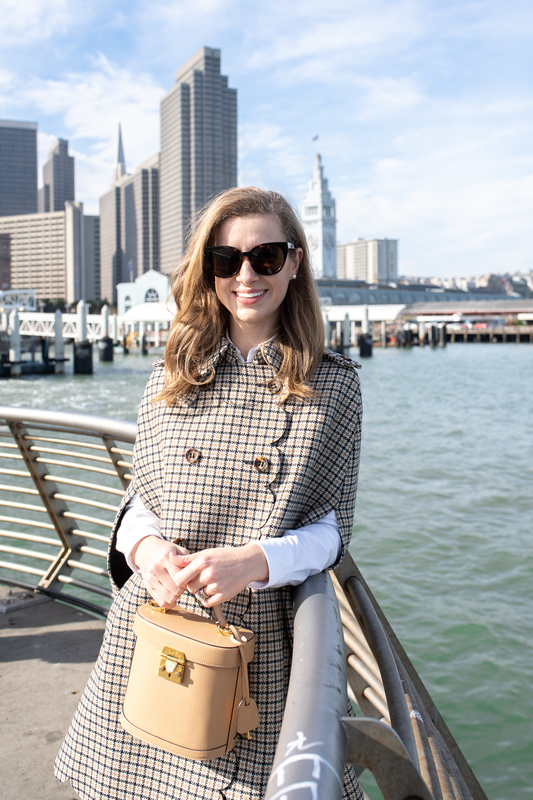 I got a lot of requests to see the checked cape I wore last week in more detail, so we popped over to Pier 14 after church to take a few photos before catching up with everyone for lunch at the Ferry Building. I love it when you guys ask detailed questions about things I share, especially when we’re talking about investment pieces. 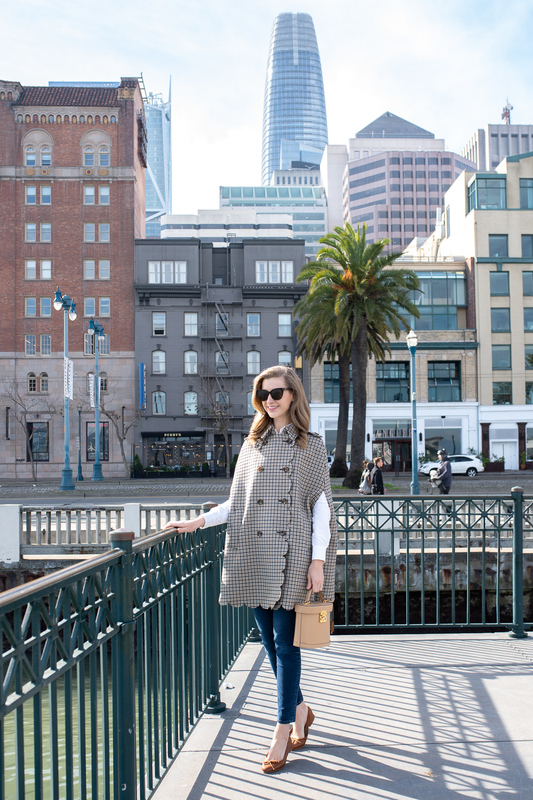 I want you to find the right pieces for your closet that will bring you joy for years to come! 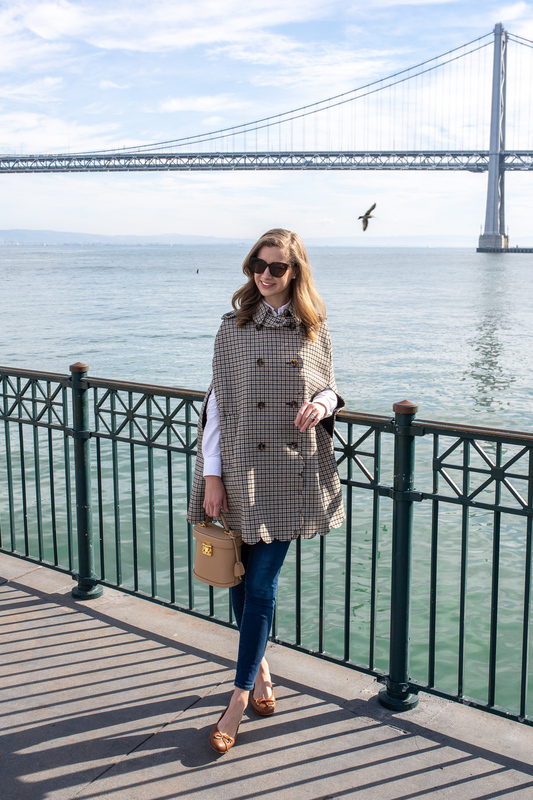 A lot of people asked about my size and height to gauge the cape’s length and it’s such a good question. 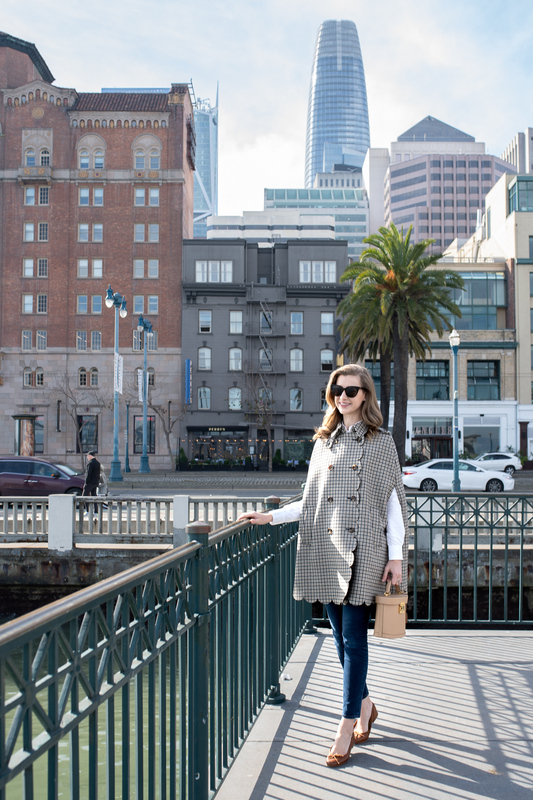 I’m 5’9″ and got the cape in an IT 38 (US 2 – my normal size). 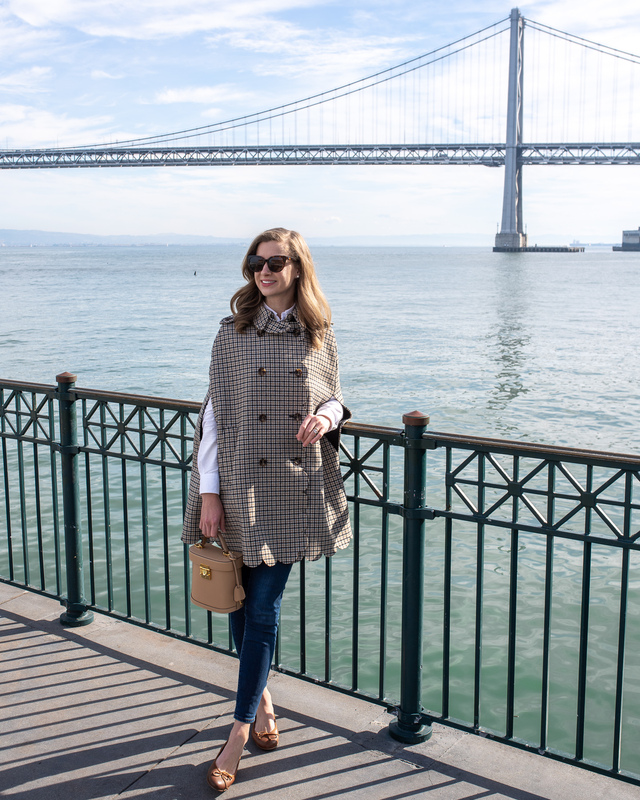 I wore flats in these photos so you could get a true sense of how long the cape is, as well as share how you might style it with items you already have in your wardrobe like a white oxford, toothpick jeans and ballet flats. Margaux kindly sent me these beautiful ballet flats and this is my first time wearing them out. They make them custom for your measurements and are so comfortable. I can’t wait to see how they wear over time as I need to replace a few pairs of other ballet flats that I’ve worn out. My biggest concern with capes is how the shoulders will lay, since capes don’t have “sleeve seams” and it’s a bit of a gamble as to where the fabric will start sloping down at the shoulder. They got the cut just right, a gradual slope that drapes beautifully but isn’t constricting. 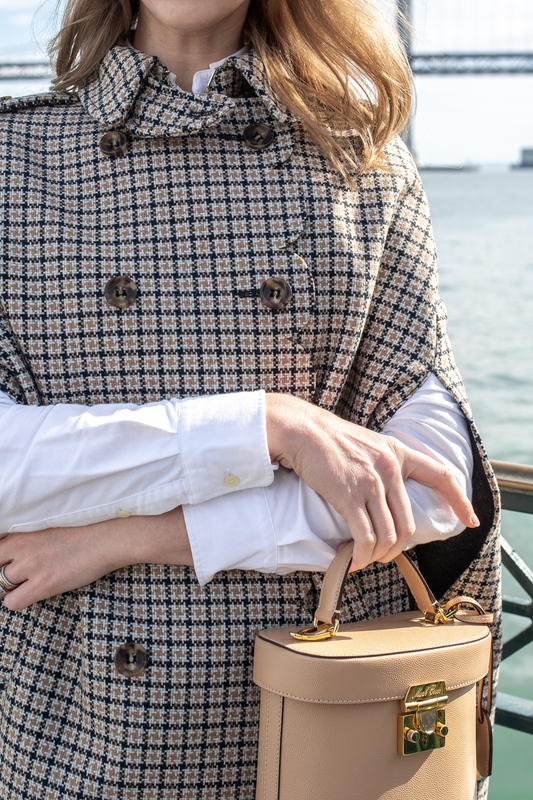 I also love how the sweet scallop detail balances the masculine tattersall pattern of the fabric, and the tan and black check means it will go with almost everything in my closet, from casual looks to a pantsuit! Also worth noting that I got caught in the rain without an umbrella last Friday, and though this cape is a wool blend (68% Wool, 22% Polyamide, 5% Silk, 3% Acrylic) it didn’t smell like wet wool at all. (A huge pet peeve of mine.) 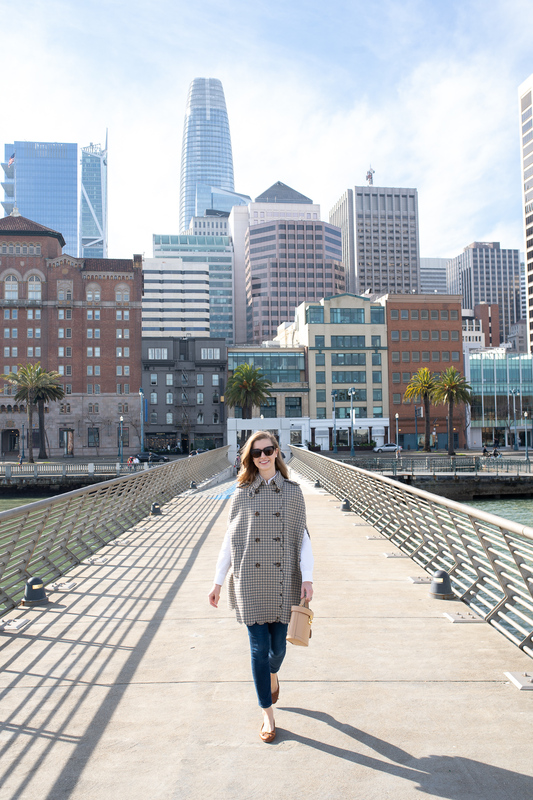 This cape is my first piece by Red Valentino, and I’m so impressed I’m looking at other items from their collection like this floral statement coat or this elegant trench. 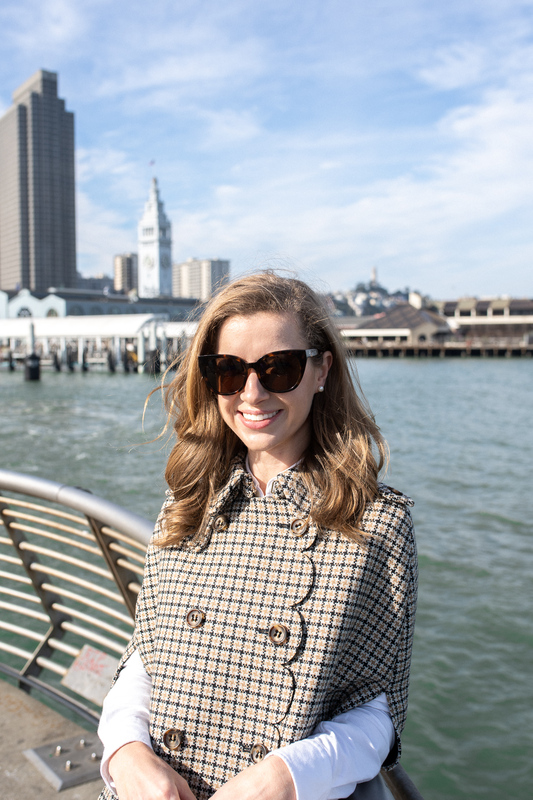 As I mentioned before, we took these photos on Pier 14 at the end of San Francisco’s Embarcadero. 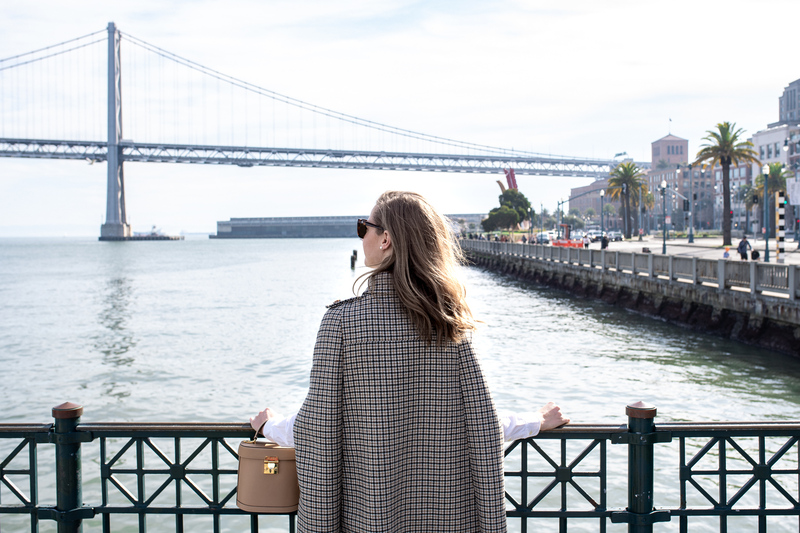 If you’re visiting San Francisco I recommend stopping by this pier to watch sailboats pass under the Bay Bridge and for a gorgeous view of downtown and Coit Tower. 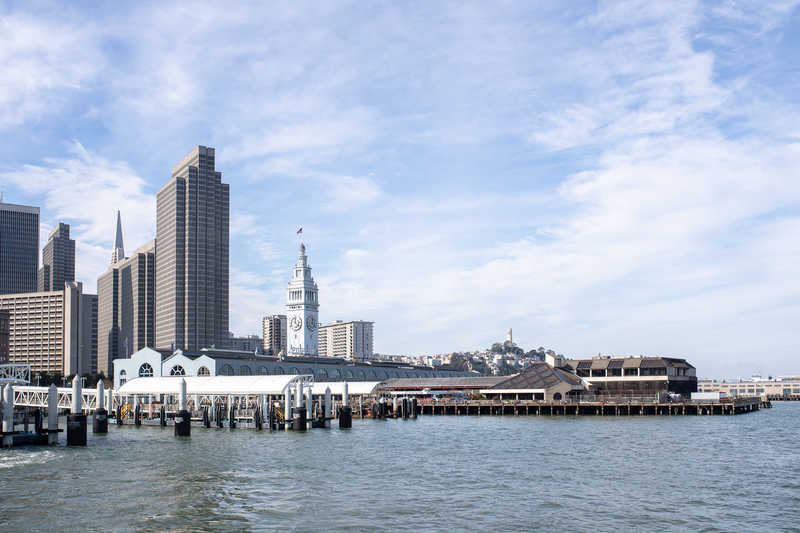 Pier 14 is much less crowded than the piers further north and right next to San Francisco’s Ferry Building – a great hall full of delicious artisanal shops and food stalls including Hog Island Oysters and Humphrey Slocombe ice cream. 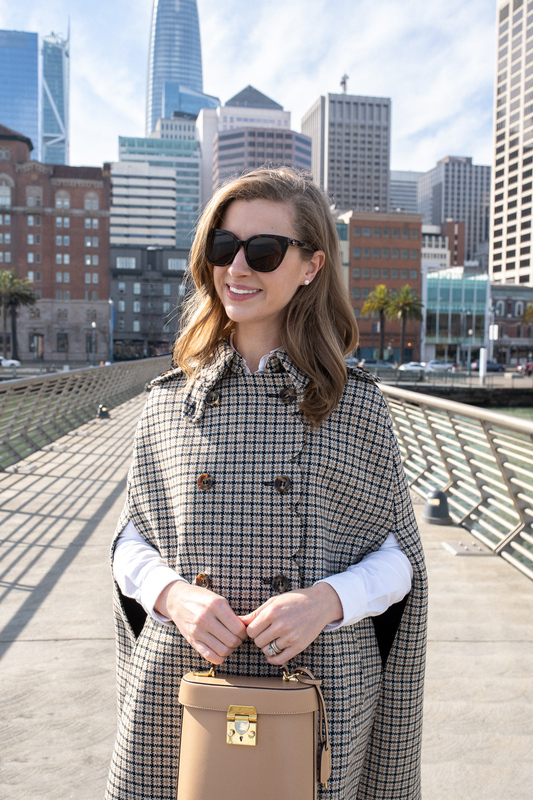 Whenever visiting SF bring a jacket (or a cape!) of some sort as it’s always a little chilly even in the summertime. Thanks as always for reading and let me know if you have additional questions in the comments below!